I wrote a guest post for the Salt & Honey Market blog (https://www.saltandhoneymarket.com/blog/2017/11/24/guest-post-stephanie-hock-studio-tour) and gave a tour of my studio, including several of my favorite things that make my work better! The market opens TONIGHT with a Meet the Maker party from 6-9 and then for two weeks (12/5-12/16) starting tomorrow from 10am to 10pm. Gateway Mall (north side by the fountain). Come shop for some great presents from local artists! Repost from @saltandhoneymarket using @RepostRegramApp - Meet @stephaniehockart! Her bright, colorful paintings of everyday life are full of beautiful brushstrokes. We absolutely love the studio tour she sent us that’s up on the blog! Go read about her process, her favorite materials and see a little glimpse of what it takes to be a fine artist. See her work at our market both weeks! Hi! My name is Stephanie Hock and I'm an acrylic, impressionist painter. When I started painting, we were living in my parents' basement and I only had a little corner of the family room that was mine. I had three tiny children with one on the way, and they got into my stuff constantly. But I kept creating and learned a lot and now four years later, I'm happy to have my own studio with a door (that locks!). It's right next to the playroom, so I can still listen to those little mischief makers, but it's become such a happy place where I love to be and love to create. My favorite brushes come all the way to my Utah studio from England! There's a great company there called Rosemary Brushes (https://www.rosemaryandco.com/) and I'm convinced they make the best brushes on the market. They hold paint so well and are surprisingly affordable for being so great. The company is wonderful to work with and it's like Christmas to open up their brown paper packages. My current favorite are the Evergreen Long Flats, but I really think you can't go wrong. I buy all my paints from a company in LA called NovaColor Paints (http://novacolorpaint.com/). You can get big tubs of paint that are so high quality (with really good pigment) for once again, really good prices. They ship fast and my tubs last forever. Another artist who also uses these paints recommended putting them in honey jars so they're easier to squeeze out while you're working (since they come in tubs not tubes). I bought mine from a company called Better Bee (https://www.betterbee.com/less-than-3lbs/csb1-16oz-clear-skep-bottle.asp) and got high flo spouts. I snipped the tips with scissors and just put the lids back on and then they stay fresh forever, but are easy to remove and squeeze out as I'm working. Plus I love the look of all these lined up on my shelf. I paint with a limited palette, only using a couple versions of the primary colors and then I mix all my secondary colors and other colors from there. I made myself this cheat sheet on a piece of masonite board so I could remember certain color combinations when I want a really vibrant green or a really muted green, etc. 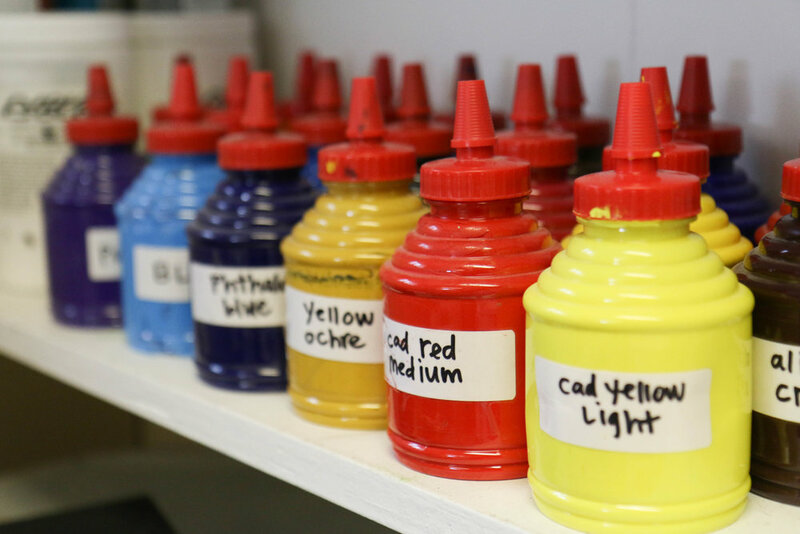 The best book I ever read about color mixing was called, "Blue and Yellow Don't Make Green" by Michael Wilcox (https://smile.amazon.com/Blue-Yellow-Dont-Make-Green/dp/0935603395/ref=sr_1_1?ie=UTF8&qid=1510092199&sr=8-1&keywords=blue+and+yellow+don%27t+make+green). If you have ever wondered why your purples come out more browns, this is the book for you! It was so insightful to pay attention to which way each primary color "leans" and then mix the two that will give me the result I want. So, I use the honey jars to store the paints, but I work from a palette that's actually an egg tupperware (https://www.walmart.com/ip/Rubbermaid-Durable-Egg-Keeper/16408620). Since acrylics dry so fast, this keeps me from wasting too much paint from day to day. 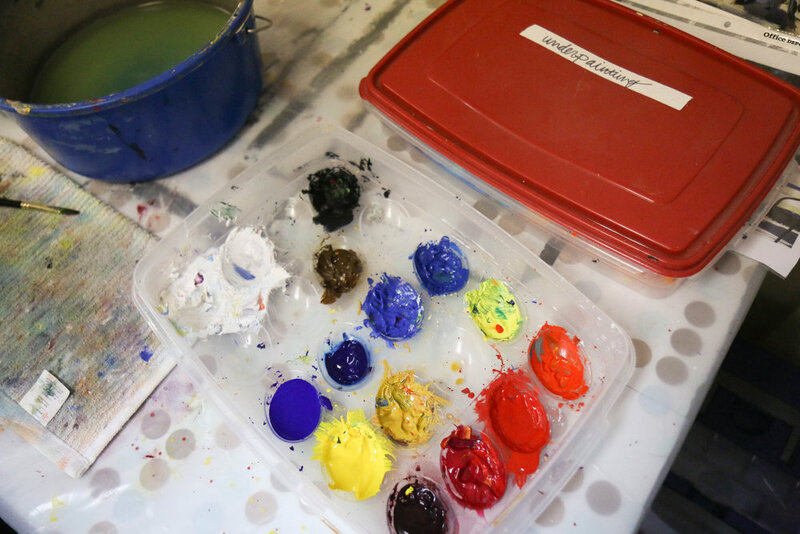 I squeeze a little amount into each crevice, pull from that on my flat palette as I mix colors, then spritz the whole tupperware with a spray bottle of water I keep in my studio and put the lid on at the end of the day and the paints are still wet and ready to use the next day. My studio has really low ceilings and for the longest time I couldn't find a good easel that worked in my studio. Most easels have a center mast that goes up as you adjust the height of your canvas. 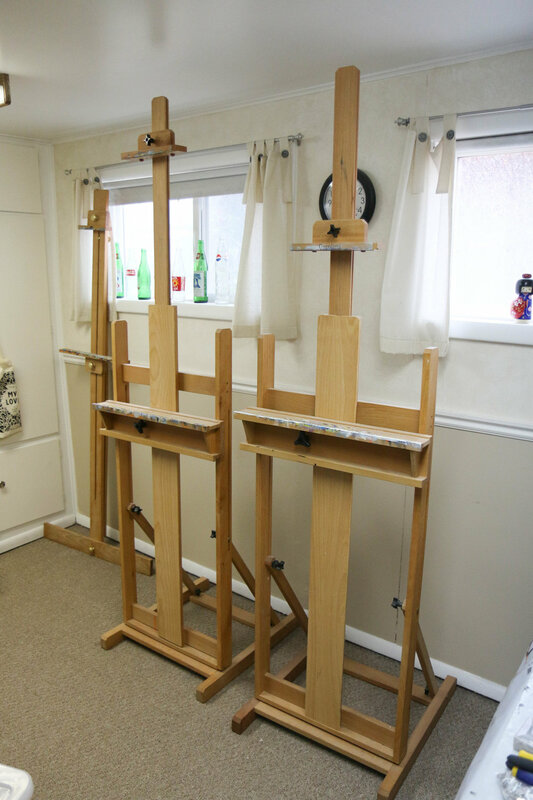 I finally found a great H-frame easel called the Carolina Easel from Jerry's Artarama (http://www.jerrysartarama.com/easels/studio-easels/h-frame-easels/carolina-studio-easel). The center mast can go up and down, but you can adjust the top and bottom grips independent of the easel height. I have two and use them constantly. They can go low enough that I can sit and paint if I'd rather not stand and they're sturdy as I work. I love them. I went to a thrift store once and bought someone's old computer desk chair. It's become one of my favorite things in my studio! It makes such a difference to be comfortable when I work long hours on projects. I like that it's adjustable and rolls as I sit at my table or need supplies on the other side of the studio. 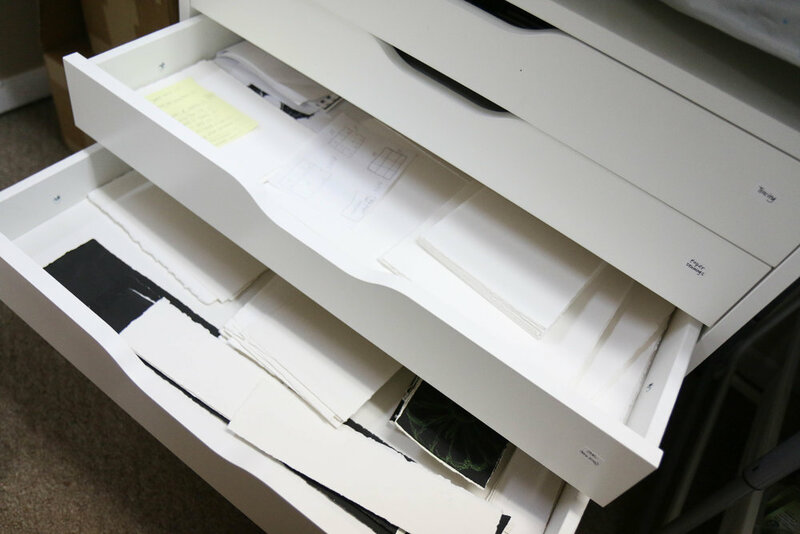 I bought a flat file at Ikea (http://www.ikea.com/us/en/catalog/products/40196241/) to store all my sketch books, drawings and papers. It fits nicely under one of my tables and keeps all my nice paper flat and clean ready for drawing and painting on. The stickers on the drawers labeling them are Avery Removable All-Purpose Labels (https://www.walmart.com/ip/Avery-R-Removable-ID-Labels-Handwrite-Only-1-2-x-3-4-labels-2-7-8-x-4-1-16-sheets-White-Removable-25-up-21-sheets-525-PK/17163682) and they're the best for labeling things and not leaving a sticky residue. I use them for vendor numbers for markets (that I might not want to leave on my product forever) or price tags or all kinds of things. They peel right off and don't hurt the item at all. I'm an avid reader and especially love reading art books. I saved my art history textbooks from college and have loved adding to my collection in the several years since. I'm grateful for how many masters before me have been willing to share their wisdom and how much that's influenced my art. I also subscribe to art magazines and like seeing what's going on in the broader art world outside of just my city or state. One of the first books I read was "The Artist's Way" by Julia Cameron and that helped me work through my artists blocks and get creating. I mentioned "Blue and Yellow Don't Make Green" and how helpful that's been for color mixing. "Daily Painting" by Carol Marine had so many good tips in it, I especially liked thinking about how to use grays or grayed out colors to my advantage. "Steal Like an Artist" by Austin Kleon is a classic. "Big Magic" by Elizabeth Gilbert was another transformative book for opening yourself to the magic the universe is offering to help push forward your work. I just finished "Painting What You Want to See" by Charles Reid and I appreciate how much it made me think about value. I'm currently reading "You Are a Badass at Making Money" (pardon the language) by Jen Sincero and am loving it! So much good wisdom in all these pages that has helped my career. I'm always excited for the next recommendation and what I can learn from it. I think my studio was the previous owner's sewing room. I love the idea of creating in a space that's been the place of someone else's ideas and creative energy. I like the button wallpaper she left me. But I really love the pegboard she had on one wall. It keeps tools in easy reach for me and keeps my work spaces clean and organized to have things hanging. I also keep a list on my wall of all the shows I'm doing for the year and I add commissions and charity donations and other things to the list as I go. I have all this information on my computer (I like Google sheets cause I can get it from my phone or computer), but it's nice to see it on the wall while I'm working and not have to look things up all the time. It keeps me on track. A smart artist I know said he always sets his own deadlines around the real deadlines and tries to have everything done at least a month before it's actually due. I think that's so smart and I'm still working on getting myself there. Also, this isn't part of my studio, but I use a program called FileMaker to keep track of all my paintings and it has become my best friend. It's so easy to search for things and get all the information (title, price, where it is now, when it was painted, story behind it, who bought it, what shows it's been in, etc). I mark where things are going and can print labels for everything really easily without having to retype each individual label. I know I'm the rebel of the art world to actually be super organized about my information and geek out about mail-merging, but there it is. If you find yourself interested in knowing more about this, it's probably a conversation for a one-on-one email, feel free to message me! I keep lots of things in my studio just purely because they inspire me. I made a big board as part of a college art project. Once the project was over and disassembled, I turned it into my inspiration board and started putting up anything that inspired me, famous art in postcard form, quotes I liked, messages to myself, drawings my kids have made. It's been with me for twelve years now and been a rotating source of inspiration. I always want my studio to be a place I WANT to be, so keeping things here that bring me joy when I look at them is a good part of that. I have a globe to remind me of the places I want to travel. A mountain to remind me of the place I call home. A jar of seashells my daughters and I have collected on many different shores. Bottles from my grandma's house next to bottles I collected on a college trip to Mexico.... I've always thought buying art is like falling in love, and having objects that bring you joy is born from the same place. We should want to look around our space and love it. Thanks for visiting my studio! You can see more of my work on my website: https://www.stephaniehock.com/ or come check out my booth at the Salt & Honey Market December 5-16 at the Gateway Mall!